MEMORIES of a 6-0 thrashing by Rangers years ago flooded back for older fans when Dumbarton lost to the Ibrox giants by the same score on January 2. The Ladbrokes Championship leaders, fresh from a 4-2 victory over nearest Hibs, totally dominated throughout as 36 year-old former Scotland striker Kenny Miller grabbed a hat-trick and the three points for Mark Warburton's men. Sons played well at times and never gave up, but they collapsed in the later stage of the game. 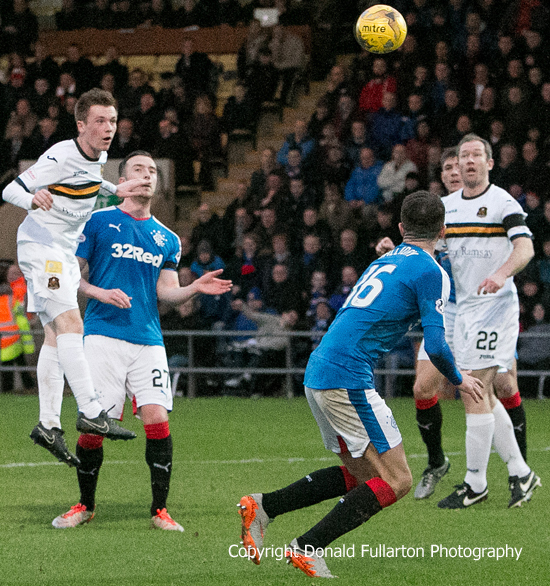 Just before half-time Miller bundled the ball over the line to give Rangers a 1-0 lead, despite vocal Dumbarton complaints of a handball infringement on keeper Mark Brown. On 47 minutes Sons had their first serious attempt on goal when Jon Routledge beat the keeper West Foderingham to a Kevin Cawley cross, but headed just wide. After a brighter start to the second half from Dumbarton, Rangers reasserted their dominance.Miller added a second on 59 minutes, nodding home with a free header from close range. Five minutes later Miller had his hat- trick, bursting through to score on the break after Sons had spurned a rare half chance at the other end. The dangerous Martyn Waghorn made it 4-0 on 71 minutes, with a side-foot home inside the six yard box. A deflected free kick from Andy Halliday on 81 minutes caught out Brown for the fifth goal, the ball spinning high into the corner of the net, and James Tavernier added a sixth shortly afterwards, with a long, looping strike into the far corner from the right. The picture shows young striker Donald McCallum heading for goal, but the header went wide.